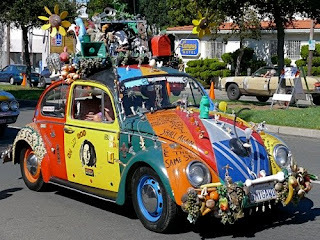 I ran into my former folk art student Kat Bevington today and it reminded me that she had written a great blog post about Art Cars for my Cooperstown Graduate Program class last fall. I haven't posted it yet because the post and images were on an old laptop that went kaput over the winter. A little digging into my old email turned up the post, however, and I found some good images she references in the text, so here it is. Americans love their cars. 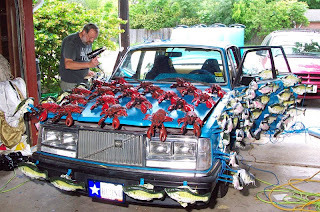 Sometimes that love turns into a different emotion, the kind that expresses its self in 10,000 pens glued to the hood, a flame thrower on the roof, or two hundred and fifty plastic singing fish and lobsters mounted to the side. Art Cars are definitely attention-getting. 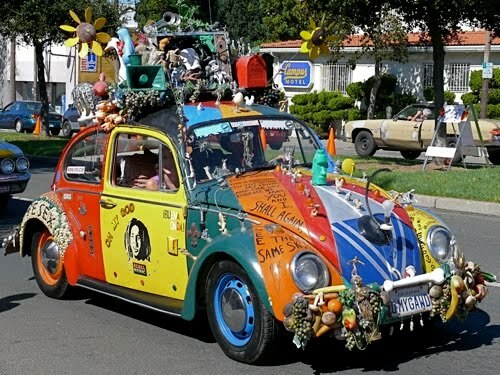 If art is in the eye of the beholder, any auto enthusiast should get a kick out of Art Cars. Not to be confused with parade floats, these drivable works of wonder are registered, insured automobiles created by artists from various backgrounds from self-taught folk artists to custom car experts. Rather than create a “cherry” version of the car’s past glory, Art Car artists create crazy rides using paint and a variety of interesting objects. Interestingly, unlike in other car groups, almost half of the artists are female. If you ever find yourself near San Francisco, Houston, Minneapolis, or Baltimore, treat yourself to an Art Car event. 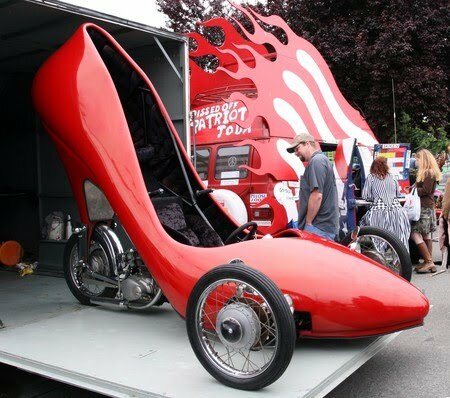 These festivals and parades showcase over 100 unique auto creations from all over the United States and Canada. Notable wild wheels from past events include the Glass Quilt, a VW Bug elaborately covered with marbles, and the Red Stiletto, a bright red high heel-shaped vehicle dubbed “the sexiest car ever.” In addition to decorated vehicles and their respective owners of in matching costume, the festivals commonly feature live music performances, food, film screenings, fashion shows, dancing, and kids workshops where kids can create an Art Car from scratch. Art Cars are as diverse as the people that make them. They give owners who have a passion for art and cars with an outlet for personal expression. 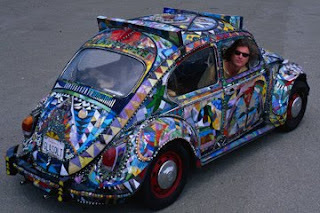 Many Art Car artists see their cars as an extension of their identity and personality, adding new meaning to the concept of “you are what you drive.” Philo Northrup, a Car Art enthusiast, is quoted in the September 22, 1997, issue of Wired News as saying “You cross a line where you are saying ‘creativity and self-expression are more important than resale value.’” Art Cars provide artists with a way to incorporate art into their everyday lives as they drive their vehicles to work, to the store, and on the highway. These mobile masterpieces also add to part of the broader goal to expose contemporary art by self taught artists – bringing folk art to the folk. Whoever said that you cannot use your car as a canvas is definitely wrong! 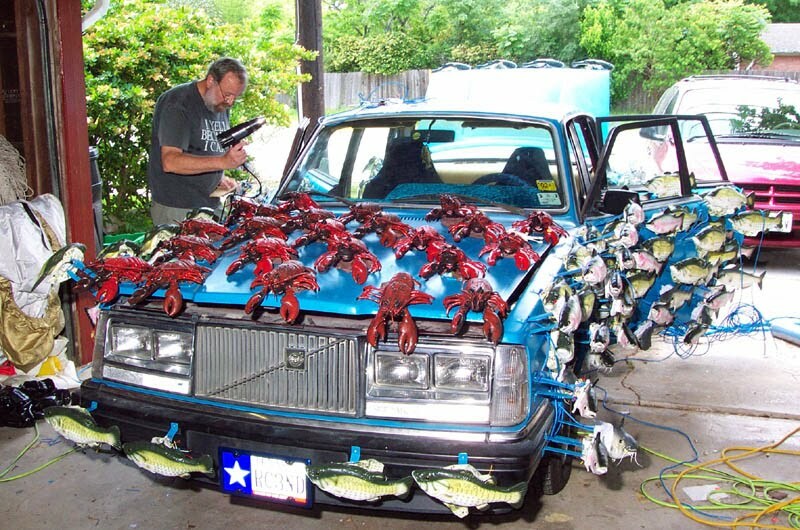 And I thank these car owners for proving that you can do art on everything. Sure, their art is kinda different, but they still manage to capture our attention. Good job!